Edinburgh Cast Metals is a foundry specialising in cast iron work. Production includes architectural pieces and fabrication for artists. Fraser Waugh uses the traditional process of Green Sand Moulding which is an age old traditional process in foundry work. Typical clients include blacksmiths, colleges and the public. Using Green Sand Moulding, Fraser is able to produce anything from bespoke one off’s through to batch production. Projects range from typical cast iron architectural pieces such as gates, railings and fireplaces through to artwork and crafts. If you’re looking to begin a project it’s best to get in touch with a rough drawing or image of what you’re looking to produce. 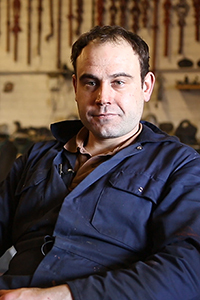 The Company was founded in July 2012, by Fraser Waugh, 27 years old who is the last trained green sand moulder and general foundryman in Edinburgh. All other local foundries had closed and Fraser wanted to keep this tradition alive.